Last edited by MrCasinoGames®; 1st January 2015 at 03:53 PM. Looks like you're going to have a busy week Stephen. New games on three of the top European suppliers stands demands respect. It shows what can be achieved and it's amazing how much the International casino world has been changed in the last 15 years or so by 3 table game developers from the English midlands. Roulette-18® ICE-2015 at TCS JohnHuxley Booth (S5-250). Mr Casino Games® will be showing Roulette-18® and other games at ICE-2015 London in TCS John Huxley Booth (S5-250). Last edited by MrCasinoGames®; 24th November 2015 at 07:33 AM. Mr Casino Games® will be showing S.A-Y's® Jackpot-Street Roulette™ and other games at ICE-2015 London in ABBIATI Booth (S5-250) and his Join-Booth PST (S5-242). Mr Casino Games® will be showing Ten20™ Baccarat (Zero Bonus) and other games at ICE London in TCS John Huxley Booth (S5-250). Ten20™ is a Side-bet to any standard Baccarat/Blackjack game. 1. Players may wager the optional Ten20 Side-bet on the Player or Banker hand before the game begins. 2. Player and Banker receive their initial 2-card hand. 3. Ten20™ wins when the selected (Player or Banker) initial 2-card hand totals zero. Last edited by MrCasinoGames®; 24th January 2015 at 01:50 PM. Mr Casino Games® Automatic-Win Blackjack™. Mr Casino Games® will be showing Automatic-Win Blackjack™ and other games at ICE-2015 London in his Join-Booth PST (S5-242). • 21-points: Automatically-Wins 1 to 1. • 5-card without busting: Automatically-Wins 1 to 1. • Must stand on hard 14 or higher and draw to hard 13 or lower. • May hit or stand on soft totals. • May split Aces once (split Ace with 10-K is an Automatically-Wins). • No soft double and No surrender. Last edited by MrCasinoGames®; 24th January 2015 at 01:55 PM. Mr Casino Games® will be showing Power-8 Baccarat-Progressive on TCS John Huxley GFL Bonusing system (a Floor-wide Progressive) at ICE London in Booth (S5-250). Come and see how it works. Mr Casino Games® will be showing Rollette® Double-Hit® at ICE-2015 London. Mr Casino Games® will be showing Rollette® Double-Hit® and other games in His Join PST Booth (S5-242) at ICE-2015 London. 1. Players place their bets on the Rollette® Double-Hit® layout. 2. A shaker containing two 20-sided dice is shaken by a Player to determine the outcome. 3. A Double-Hit® Straight-bet wins when one or both dice match the Player’s selected number. Winning Straight-bets pays according to the Pay-table. 4. A Double-Hit® Split-bet wins when one or both dice match either of the Player’s two selected numbers. Winning Split-bets pays according to the Pay-table. 5. A Double-Hit® bet (Double-Red/Black), (Double-Odd/Even) and (Double-High/Low) wins when both dice numbers match the selected group. Winning bets pays according to the Pay-table. Last edited by MrCasinoGames®; 24th January 2015 at 01:47 PM. Mr Casino Games® Odds-Win® Blackjack. Mr Casino Games® will be showing Odds-Win® Blackjack and other games in his Join-Booth PST (S5-242) at ICE-2015 London. Odds-Win® is a Blackjack Side-bet which pays when the Player wins or pushes his hand after starting with a 2-card Odd Total. 3 to 1 for a Winning Player hand starting with a 2-card odd total. 2 to 1 for a Push Player hand starting with 2-card odd total. 1. Player wagers an Odds-Win side-bet and receives his two card hand. If the total of his two card hand is even then the side-bet loses. 2. The Player wagers an Odds-Win side-bet and receives his two card hand. The total of his two card hand is odd, so the dealer leaves the Odds-Win side-bet in action. 2a) if the Player loses the hand, the side-bet loses. 2b) if the Player wins the hand, the side-bet pays 3-to-1. 2c) if the Player pushes with the dealer, the side-bet pays 2-to-1. Last edited by MrCasinoGames®; 28th January 2015 at 09:30 AM. Roulette-18® At ICE London 2015 in TCS-JohnHuxley Booth (S5-250). At ICE London 2015 in TCS John Huxley Booth (S5-250). Mr Casino Games® will be showing Roulette-18®, Power-8 Baccarat-Progressive™ and Ten20 Baccarat™. Roulette-18®! Exciting, Space saving alternative to traditional Roulette. Played using a 20-sided die instead of a wheel, Roulette18® is a fast and new table game that uses a unique table layout that does not require a roulette-sized table. The objective of this space-saving game is simple. Players place their bets on the Roulette-18 layout – which is similar to a Roulette layout, but smaller – and a red & black numbered die (numbered from 1-18, plus a green ‘0’ and a ‘00’) is rolled in a shaker before being exposed. According to the bets placed and the number rolled, the Dealer then pays winning bets. Like traditional Roulette, players can place straight-up, split, street, corner or line bets. 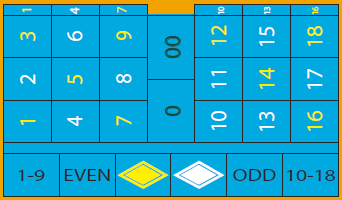 They may also choose to bet on numbers of one colour, numbers that are odd or even and numbers ‘1-9’ or ‘10-18’. In this game, the double zero is ignored. Last edited by MrCasinoGames®; 2nd February 2015 at 08:31 PM. Double-Hit® Zodiac™ at ICE-2015 London in Mr Casino Games® Join-Booth PST (S5-242). Mr Casino Games® will be showing Double-Hit® Zodiac™, Odds-Win® Blackjack, Automatic-Win Blackjack™ and other games at ICE-2015 London in his Join-Booth PST (S5-242). Double-Hit® Zodiac™ is a Dice-based version of Roulette on the outcome of two 12-sided Zodiac-dice with 12 Zodiac Signs. 1. Players place their Zodiac-bets on the Double-Hit® Zodiac™ layout. 2. A shaker containing two 12-sided Zodiac-dice is shaken to determine the outcome of the Zodiac-bets. 3. A Zodiac Straight-bet wins when one or both dice match the Player’s selected Zodiac-sign. Winning Straight-bets pays according to the Pay-table. 4. A Zodiac Split-bet wins when one or both dice match either of the Player’s two selected Zodiac-signs. Winning Split-bets pays according to the Pay-table. 5. A Zodiac Colour-bet wins when one or both dice match the Player’s selected Colour. Winning Colour-bets pays according to the Pay-table. Last edited by MrCasinoGames®; 31st January 2015 at 01:06 PM. Power-8 Baccarat-Progressive™. At ICE London 2015 in TCS John Huxley Booth (S5-250). At ICE London 2015 in TCS John Huxley Booth (S5-250). Mr Casino Games® will be showing Power-8 Baccarat-Progressive™, Roulette-18® and Ten20 Baccarat™. Power-8’s is a Progressive-bet offered for Baccarat, which can be played in addition to an initial wager on either Player or Banker, by placing a bet on the associated flashing pad. In Power 8’s, players bet on the combination (suit) and frequency of 8’s dealt, either as part of the initial 4 card deal or from the total of drawn cards representing a result in the main game. The three top progressive jackpots are shared equally between all those who placed a bet on the winning flashing pads. Mr Casino Games® will be showing Jackpot Streets® Roulette™, Odds-Win® Blackjack, Automatic-Win Blackjack™, Double-Hit® Zodiac™ and other games at ICE-2015 London in his Join-Booth PST (S5-242).